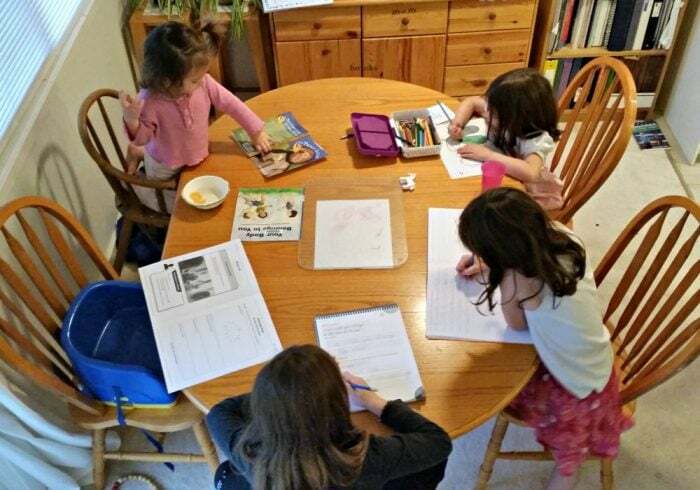 One of the challenges of being a homeschool mom is homeschooling multiple ages of children. This year, I am teaching Grade 4, Grade 3 and Kindergarten to my oldest three girls (with a 2-year-old and a new baby also requiring my time). Our dining room often feels like the one-room schoolhouse that Laura Ingalls Wilder describes in her novels (without the wood stove and cute desks). 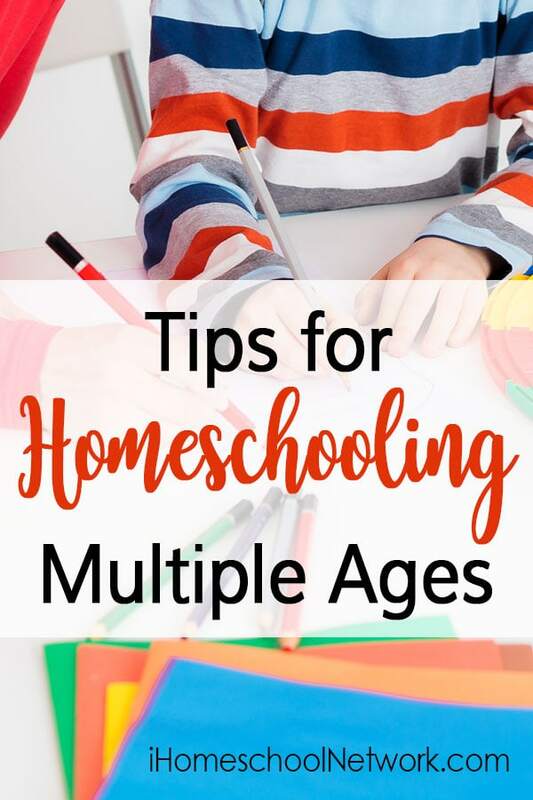 Here are my tips for homeschooling multiple ages and grades without losing your sanity. Unit studies allow you to teach the same topic to your children at different levels. Our history program is designed like a unit study. This year’s program is divided into 10 units, each of which we spend about a month covering. My older two girls do history together, and I adapt the readings and assignments for their interest and ability levels. For example, I could assign a more advanced novel to my older daughter or require a longer essay or book review from her. We’ve also used online unit studies. These allow my daughters to work at their own pace on the computer. This is great for when I need to spend more time with a younger child (or a new baby). The older girls can complete the unit study and then tell me about what they learned or show me the assignment they completed. Another computer-based program we’ve used is Smartick. This math tutoring program reinforces what the girls are learning in their math lessons. It’s a fun review for them and also lets them play math and logic based games once they’ve completed their learning session. I’ve found this handy during summer and Christmas holidays (they spend 15-20 minutes a day reviewing math). Again, it’s something I can assign to them when I’m busy with another child (or when the baby is super fussy and I can’t sit down to teach a math lesson). Other friends of mine with multiple grades have also used computer-based learning, as this eliminates the need to do a lesson with a specific child. Consider your child and how they learn when deciding if this is a good fit for you. For example, my oldest loves anything tech and jumps at the opportunity to do a lesson on the computer. My second daughter prefers to read or write, while my third likes having me help her out. I’ve found that the younger grades (K through 3) are a bit harder as a homeschool mom because the children require more support and assistance from you. Despite this, I’ve found ways to assign independent work so that my daughters learn to study on their own. My preschooler liked having workbooks just like her sisters. I could read the instructions to her and then let her work on it (tracing, copying numbers, matching, etc.) while I helped an older girl with her work. This year, my oldest daughter moved from a teacher’s manual in math to a student textbook. She has enjoyed being able to do math on her own, and I’ve enjoyed simply having to check her math instead of teaching a lesson. With my Grade 3 daughter, I teach the math lesson and then she completes a couple of pages of practice questions on her own. I also teach my Kindergarten student a math lesson, so even though I’m teaching three kids math, I only have to do two lessons because my oldest reads her own lesson. This year, I’ve also begun assigning more reading to them for science and history. In past years, I read most of their textbooks to them in these subjects, so that we could talk about them. Now, I glance over what they need to cover so that I know what they are studying, then I leave it for them to read. It’s easy to talk with them quickly about it later or to have them do a small written assignment or review questions later in the week, to ensure that they’ve read (and understood) the subject matter. Adjusting your homeschooling routine may also help your day run more smoothly in homeschooling multiple ages. Consider who needs to do schoolwork when. For example, I like to lay out the girls’ schoolwork early in the morning, but then I let the older girls decide when they want to complete their work. I remind them to complete their work and have time to teach math lessons to my Grade 3 and Kindergarten daughters. I’ve found my kids work best if we do school in the morning, but yours may work better at another time of day. If you have a child in preschool, you may want to work with him or her first. This “fills up their bucket” of love and attention, so that then they are more content to work on their own while you move on to help an older child. A preschooler who feels ignored or neglected because you are spending all your time with students who need more help may become whiny or exhibit other attention-seeking behavior. If this is happening, consider how you can meet their needs so that your day runs more smoothly. I used to start our day with math, as this was the toughest subject and took the longest. I soon realized that this led to grumbling and complaining on the part of my daughters. Instead, I began starting with history, which I read to them while we all sat together on the couch. Even my preschooler could sit and listen and look at the pictures. Everyone felt included in the lesson and we started school on a positive note. Then we transitioned to other subjects, with each of the girls taking turns going first. Sometimes, my older two girls help their younger sister with her schoolwork. They like to be the “teacher” for a little bit. Having my Grade 3 daughter read instructions to my Kindergarten student lets me go over math work or other assignments with my older daughters. You could assign a “Teacher for a Day,” so that an older sibling is responsible for a younger child each day. This is also a learning opportunity for the older children, as helping a younger child can be a form of review (depending on how much younger the sibling is). We don’t have a designated school room for our homeschool. Instead, I’ve found it helps to switch where we work, depending on what work the girls are doing. A lot of our schoolwork happens around the kitchen table. However, this can sometimes lead to squabbles between students as they find it more interesting to pester their sister than to do their own work. Then I’ll ask one of them to go work at my desk in my room or in their own room. One of my daughters was given a lap desk for her birthday. This has been handy as she can sit on her bed and do pencil work or sit on the couch and complete workbooks. If they are reading for science or history, they’ll usually go to the couch. Again, if one student is having troubles concentrating, they can take their reading to their room. I also talk to other siblings about respecting those who are studying by playing quietly or playing in another area. While we all like the idea of a traditional school desk, it may not work for your students. When I was a homeschool student, my twin brother often did his math while laying on his bed, and his reading while flopping across our footstool with his book on the floor. I preferred to work at my desk in my room. When you are homeschooling multiple ages at the same time, letting each of them work in the way they learn best (even if it looks uncomfortable to you!) can be a good way to maximize your study space. This is something that I haven’t tried myself (yet), but it has worked well for homeschool friends of mine. 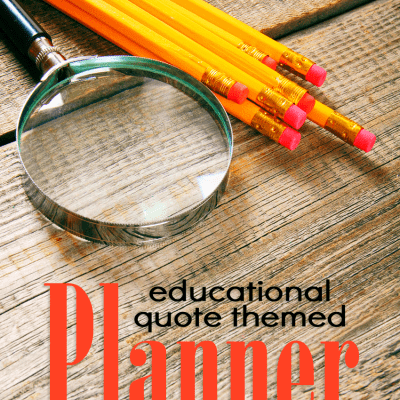 Get together with another homeschool family (or two) to complete lessons together on a weekly or bi-weekly basis. For example, my friends Anna, Clara and Tajsha got their children together every two weeks to do science lessons. In the day, they were able to complete a science unit study that would take me a couple of weeks to go over with my girls. Co-ops like this lets you spend time on the other days focusing on other subjects. It also opens up more possibilities for group work. Art is another subject that lends itself towards group work. My friend Tajsha is doing the same history program that I am, so we’ve often talked about having a monthly co-op with our kids so that they can show their assignments to each other and do some group work around the historical period we’ve studied (maybe some recitations, drama, etc). How many grades or subject levels are you teaching in your homeschool? What tips would you share for homeschooling multiple ages?